Will Vinson, the fine London-born, New York-based saxophonist, makes his Criss Cross debut with Stockholm Syndrome, a stirring collection of originals and creatively reworked material by Bill Evans, Paul Desmond and Cole Porter, all of it fired by rhythmic panache and lyrical intensity. Joining Vinson are two fellow Criss Cross artists and leaders in their own right, Lage Lund (guitar) and Kendrick Scott (drums). Pianist Aaron Parks, in his first-ever appearance on the label, and bassist Orlando Le Fleming provide empathetic and unerring support. Vinson’s music is strongly rooted in postbop but full of the kind of detail and surprise that push it beyond category. 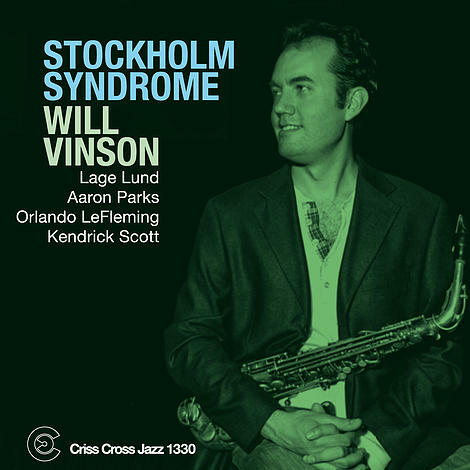 On Stockholm Syndrome we hear Vinson’s inventive voice on alto and soprano saxes (and Lund on electric and acoustic guitars); we also encounter a leader with skill and confidence to let his extraordinary band play an equal role forging a sound of subtle small-group orchestration and swinging give-and-take.